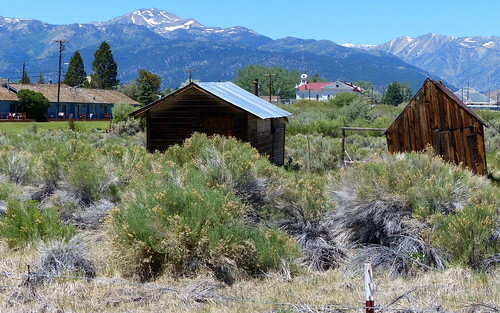 Each time we’ve crossed the Sierra Nevada on HWY 108 we’ve thought; this is really nice here. We should camp here. So we finally did. There are several US Forest Service campgrounds along 108 as it winds up to the pass, and from the descriptions they all sounded good. Two especially; those were up by Kennedy Meadows, just before you start the serious climb to the pass. We took Friday off from work to get a jump on the other campers, as these USFS camps are all first-come, first-served. Made it up there by mid-afternoon, after spending the morning explaining to the cat where we were going. My top picks for campgrounds were full by the time we got there, and we scouted out a few others but they were not to our liking. Starting to get concerned, but then we drove into Brightman Flats. This didn’t look great at first; the sites by the highway were not particularly appealing and had RVs in them. But down by the river, whole other story. Resident Expert spotted site 12, which had at least 50 feet of river frontage, shady conifers and a huge flat area for the tent. This would be home for the next two nights. There was somebody set up in site 11 – their stuff was on a picnic table, and there was a huge RV on the other side, but both were screened by the trees, and as campsites go this looked swell. The middle fork of the Stanislaus River goes right by the campsite, and provides a very soothing ambient sound, as well as attracting many birds. The forest here is a mix of Doug Fir, Incense Cedar and Lodgepole pine, with some deciduous trees in the mix. But not much understory, just big rocks and the river rushing through it all. Our neighbors in site 11 arrived, and we briefly chatted. The fellow in the “Give that man a beer” t-shirt offered us one of his surplus trout. Didn’t know this, but the Stanislaus is prime fishing ground for stocked Rainbow and native brook and brown trout. After our chat with the two fishermen, we sort of have the fishing bug again. It looks like a lot of fun. We settled in for some bird-watching, opened some wine, got the fire going. Hey, this is really nice! This was the Summer Solstice weekend, featuring the very bright Super Moon. Didn’t really need any supplementary outdoor lighting after dark. Each camping trip we try to hone our skills a bit more, and this time it was the dinner clean-up routine. In some of our early camps we were doing tons of dishes – KP was taking longer out here than at home. But now we use the cast iron skillet and otherwise clean up without much soap and water. Much better. Also, Brightman doesn’t have any potable water – you can filter water from the river, or bring your own supply. 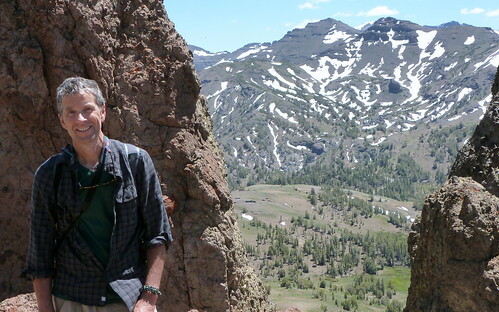 Next day I suggested that we drive over the pass and check out a hike I read about at Leavitt Meadows. 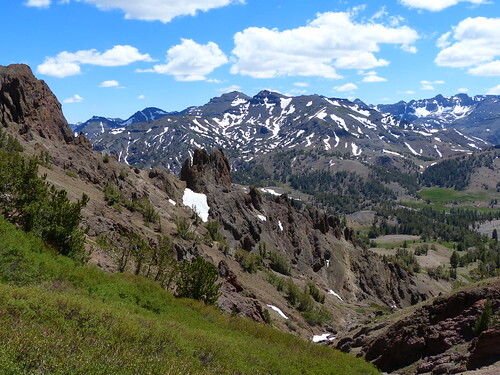 This is a spectacular drive – the pass is at nearly 10K feet; only Tioga offers a higher trans-Sierra crossing. We saw some deer bustling around on the other side, which offers a more open woodland feel. We found the trailhead for Leavitt and started out on what we assumed to be the trail, but it eventually brought us to the West Walker River, which we would have to ford to continue. The river didn’t look super high or fast, but you really have to respect water like this. We turned back and looked for another way on the other side of the river. There is a trailhead in the campground nearby, but they warn you not to leave food in your car (bears), and then don’t provide bear boxes. We had the ice chest in the Forester, and so ended up going down to Bridgeport for some supplies and figure out another hike plan. Here’s a look at Bridgeport. 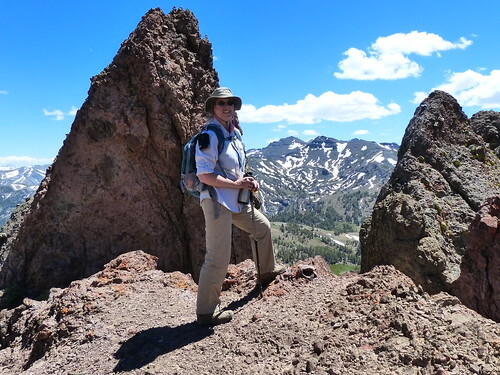 I thought it would be fun to hike some of the Pacific Crest Trail, having recently read Wild. The Sonora Pass trail head is where the PCT crosses the highway, so we drove back up to the top and headed out. I didn’t expect to get far. We hike a lot, and usually those hikes feature hills, but that’s near sea level. We’re starting near 10K here and you start climbing right away either direction on the PCT. We started north, and indeed the climbing was relentless, but surprisingly not too difficult. Here we are way up on a ridge, so you’ll believe me. It was a real treat to have a chance to chat with a few through-hikers. They had already been on the trail for several weeks, and were intending to do the whole thing. Mexico to Canada – can you believe it? As the summer goes on, I’ll be wondering where those guys are. So that was great. On the way back we started wondering what the camp would be like. Most of the campgrounds were full or nearly so on Friday, so we figured tonight would be jammed and parties in full swing. Our neighbors in site 11 took off that morning, and so we wondered who or what would take their place. I can imagine some pretty terrible camping neighbors, when I put my mind to it. But then we get back, and – nobody in site 11! Not only that, almost everybody is gone! Huge RV in 14: gone. Westfalia in 10: gone. Generic pickup truck in 15: gone. Did we miss an evacuation order? If so, we will shelter in place, because we have the place to ourselves! Saw all kinds of cool mountain birds this evening during the evening wine and bird show; Western Tanager, Stellar’s Jay, Meadowlark, and other birds we don’t get in our yard. That Tanager is something else. If you were doing a painting of a bird and selected those colors, people would say, no, that’s too much. Fun weekend. We’re now going to review all the times we’ve said “we should do that someday” and then proceed to do those things.